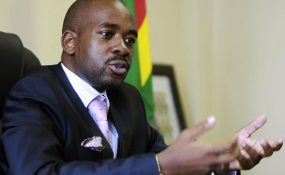 POLICE in Harare have issued a waiver on the MDC's Saturday anniversary at Gwanzura Stadium which the main opposition says shall also be an occasion to "inaugurate" its leader Nelson Chamisa as the People's President. The MDC is adamant Chamisa was robbed of a clear victory by the Zimbabwe Electoral Commission (ZEC) in the July 30 elections and has moved to organise a mock inauguration for the firebrand opposition chief. The controversial move has unsettled the state which feels this was treasonous and could allow the losing presidential candidate to whip up anti-government sentiments if allowed to proceed with the "inauguration". Information and Broadcasting Services deputy minister Energy Mutodi said Tuesday Chamisa will not be allowed to delegitimise Mnangagwa's government. "Any attempt to de-legitimise government will not be tolerated and those bent on causing anarchy will be dealt with mercilessly," Mutodi wrote on twitter. However, further doubt was cast on the opposition's event when the state moved Wednesday to issue a blanket ban on all public gatherings following a cholera outbreak that has claimed 21 people while over 2000 have been forced to seek medical attention. But party provincial chair for Harare province Eric Murai said via social media on Wednesday that police have given the nod for the MDC event to proceed free of any interruption. "Let everyone know that we have been granted permission by the Zimbabwe Republic Police. "Please let the word spread as far as possible so that everyone come and witness this historic event where our President His Excellency Adv Nelson Chamisa will take Oath before his legion of supporters. "Don't miss out on this unique event. Chamisa Chete Chete. Chamisa of the people, by the people, from the people." Murai confirmed in a subsequent interview with NewZimbabwe.com that Chamisa shall be inaugurated during the Saturday event. "It's the people's inauguration. It's the people who will be inaugurating their president because they believe the President won the election," he said. According to the police correspondence to MDC also seen NewZimbabwe.com, the MDC were allowed to proceed with the event on condition they controlled the behaviour of their supporters, they did not alter the venue and time of the event and did not try to intimidate passers-by among some of the restrictions. "You shall ensure the peaceful dispersal of your members from the celebrations. Any deviation from the above will result in police dispersing your gathering," read part of the letter written by Officer Commanding Police Harare District Chief Superintendent Winston Muzah. Police did not issue any order stopping the MDC from proceeding with its much publicised "inauguration". Earlier on, MDC spokesperson Jacob Mafume had vowed the main opposition was determined to defy the ban on public gatherings citing the need to contain the cholera outbreak. "They have used these epidemics to ban our own activities but not one of their activities has been banned due to cholera or typhoid outbreaks. They are proceeding as usual. We are therefore also proceeding as usual," he said.